Chester is a palimpsest, a document repeatedly erased and written over – the Roman Deva, Norman stronghold, distinguished by its great abbey and the famous Rows, gradually superseded by the port of Liverpool until the arrival of the canals and railways. Much of the historic centre is actually Victorian or later, which makes its architecture all the more intriguing. This September 2009 itinerary included walking-tours of Chester city-centre, including The Rows and the City Walls, and visits to Bishop Lloyd’s House, the Cathedral, the amphitheatre and St John’s Parish Church. The 48-page illustrated handbook provides an introduction to the city’s history, an account of the history of the ancient churches and the Rows and an explanation of how the city’s unique architectural heritage was conserved and renewed from the nineteenth century to the present day. There are itemised perambulations of the city walls and the Rows and an introduction to the work of the Black-and-White Revival architect John Douglas. 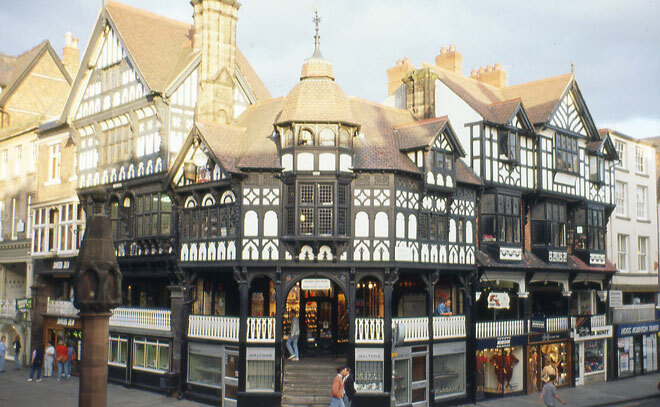 For further sidelights on Chester’s buildings, please click here.